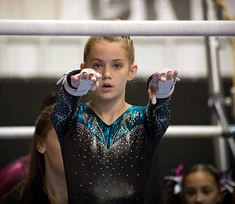 When we brought Haley to the Institute of Sports Performance, she was 7-years-old and coming off of a summer of state testing for USA Gymnastics’ Talent Opportunity Program (TOPs). Her training was rigorous, and her advancement was compounded by a severe year-long mental block on back tumbling. 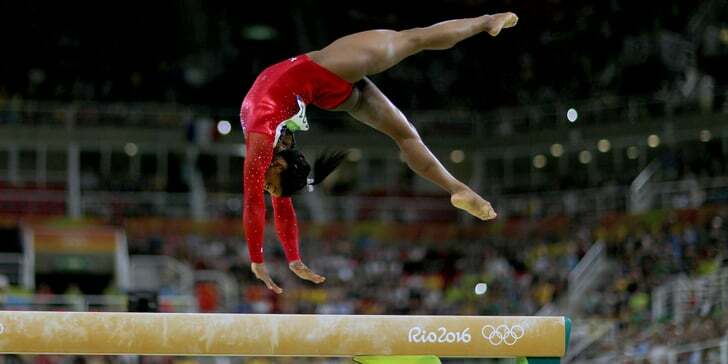 At the time, she was facing an entire fall season of Junior Olympic Level 4 competitions and National TOPs testing. 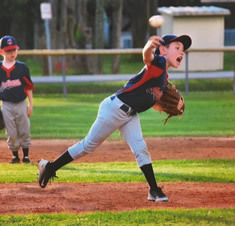 At home, she had become increasingly anxious and was on the verge of leaving the sport. We were in discussions to move Haley out of gymnastics when we found TINSSP. We noticed an immediate improvement once she started weekly sessions with Michael. She was given a voice to discuss her challenges, and we received ways to support Haley both at home and the gym. In less than four months, Haley went from Level 4 to Level 6 and had a fantastic National TOPs test. She continued to experience small breakthroughs with her mental block. Then, at her first official Level 6 competition she tumbled for the first time in months without a coach next to her on the mat and took home multiple Gold medals, including Gold on the Floor. Haley is now back to being a happy, fierce, determined 8-year-old who loves her sport again and asks to work on her mental block on a daily basis with the tools she’s has learned at TINSSP. She is more confident during competition on all events, sets individual goals for herself, and has become a supportive teammate to others facing similar issues. 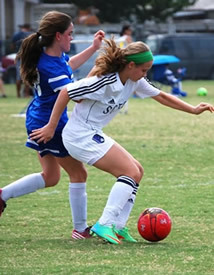 It is a continuing journey, but mental training is such a huge part of the overall sports experience and will be something Haley keeps with her for the rest of her life. We are so proud of the work she is doing and so thankful for Michael and TINSSP. Greatness means many things to many people. It can mean victory. It can mean bravery. It can mean strength of character. It doesn’t have to mean you are the best at something, but when it comes to sports, greatness always comes from joy, commitment and progress. 2 – It’s OK to be great at something, you’re worth it! Sometime when people are really good at things, they try not to show it even if they want to. Mostly it’s because we don’t want to hurt anyone else’s feelings. You are not hurting someone else’s feelings by being talented. Those people have hurt feelings already and it is NOT about you. I hate that this happens but sometimes it does. If we get hurt, watch a friend get hurt, or mess up during a very important competition, it can make us sad, scared and even make us not like competing for a while. That’s OK! What’s not ok is when fear becomes the bully that tells you what you can and can’t do. We want to help you KICK FEAR IN THE FACE!!! This fear is totally normal, but sometimes they won’t tell you. Sometimes instead of sharing their concerns with you, they say stuff like “I’m gonna pull you out if you don’t start to acting happy and trying like you used to,” because they don’t know what else to say. Mostly it’s because they love you and they will do anything and try anything to make you happy. Lots of times they need it even more than you do, especially because it is there job to do good in their sport. Sometime they call people like us before they need help, and they use us as their secret weapon against something getting in their heads. What a great idea! You can do that too! Seriously, can I tell you? You really are Awesome!!! Know why? Because you do what you do. And yes, sometimes people and coaches are going to say “You did that wrong, do it this way,” and that’s ok. But I say ‘wrong’ just means right for right now, because you are always learning. Another reason you are awesome? Because you are either so smart that you found us yourself OR someone loves you so much that they actually went looking for us for you. How cool is it to be you? We love Athletes. You are the reason we are so excited to come to work every day. If you are coming to us, it means someone believes in your talent and skills so much that they want you to have everything that you could ever need to achieve Greatness. There’s that word again. So get a good night sleep, eat a good breakfast and then talk to mom and dad about us. We want to be part of your team!